Objective: Several peptide-polymer conjugates were synthesized to enhance the bioavailability and thus the uptake of compounds into cells to improve their biomedical application. The aim of this study was to test whether the peptide-inhibitor complexes still retain their inhibitory activity on Tau aggregation. Method: We screened a large library of peptides for selecting sequences with high binding capacities to host a subset of aggregation inhibitors. The peptide sequences were identified by fluorescence microscopy and MALDI MS/MS sequencing. Drug solubilization was studied with respective poly(ethylene glycol)-peptide conjugates that complex the drugs effectively. 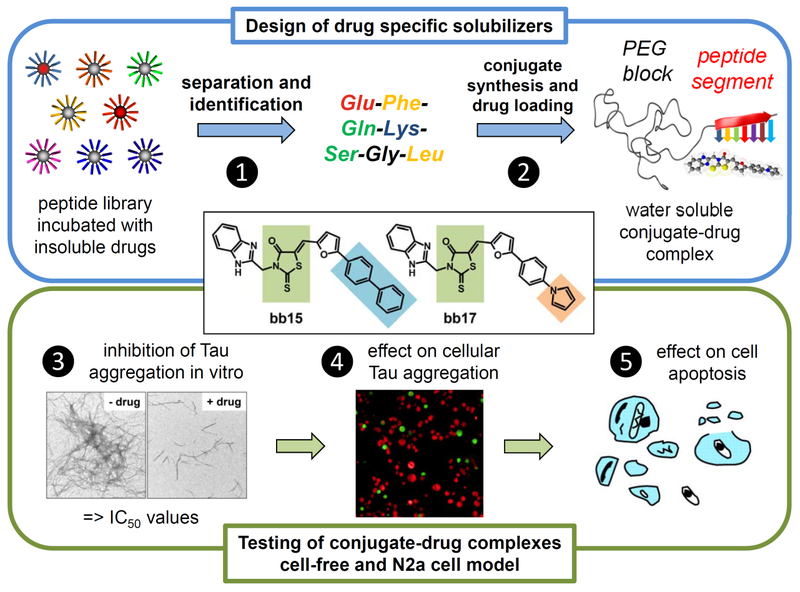 To explore whether the synthesized complexes can influence the aggregation propensity of Tau we performed in vitro and cellular assays. 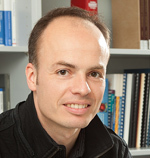 The effect on toxicity was investigated by measuring apoptosis markers. Results/Conclusion: The tested peptide-compound complexes show no decrease in the total Tau levels but decreased ratios of soluble to pelletable Tau species. This indicates a conversion of insoluble Tau oligomers into soluble forms which appear to be less toxic than the insoluble ones, as seen by a decrease of apoptotic cells. Thus the peptide-compound complexes have a higher potency than the compounds alone due to improved bioavailability of the drug.